1. We have come so far already. Child death rates from malaria have been cut in half since 2000 and overall cases have declined by 30 percent in that same period. Ten years ago, a child was dying from malaria every 30 seconds. Today, a child still dies every minute from malaria, but we continue to make great progress against that clock. 2. We have the tools to prevent, diagnose and treat malaria. Unlike so many of the health challenges facing developing countries, we know how to prevent the disease (long-lasting insecticide treated bed nets), to identify infection (with rapid diagnostic tests) and to treat the illness (with Artemisinin-based Combination Therapy, or ACT). 3. Life-saving commodities are getting into the hands of those who need them at historic rates. Over 500 million mosquito nets have been distributed in the past four years. Approximately 90 percent of people who have access to the net use it. In the first quarter of this year alone, nearly 44 million nets were delivered worldwide, enough to protect nearly 90 million people — the single biggest influx of malaria prevention worldwide, ever. We have seen a 30-fold increase in access to ACTs, with 331 million treatments delivered in 2012, up from 11 million in 2005. By diversifying the sources of distribution to include private, public and civil society supply chain systems, universal coverage of all commodities sits on the near horizon. 4. Leaders of endemic countries are charging ahead. The formation of the African Leaders Malaria Alliance (ALMA) and the Asia-Pacific Leaders Malaria Alliance (APLMA) demonstrate the commitment of the endemic country leaders, with over 50 heads of state keeping malaria high on national agendas. Governments not only have scaled up interventions, but also have implemented new, significant policies, including those that have lowered tariffs and taxes on malaria commodities. 5. 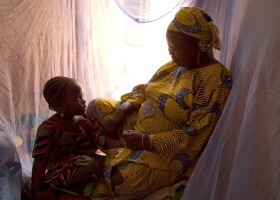 Donor countries, the Global Fund and the World Bank have shown their commitment to malaria and continue to do so. International financing for malaria control has increased consistently from $100 million in 2000 to $1.97 billion in 2013. The Global Fund, United States and United Kingdom governments, the World Bank and domestic countries have formed a partnership to ensure the ongoing coverage and replacement of all lifesaving commodities. 6. Investing in malaria is one of the best “buys” in global health. The tools are cost-effective and the return on investment is high. When counties lower their malaria burden, private investment flourishes, businesses see greater productivity, tourism barriers fall, healthcare costs decline and economies thrive. The world stands to gain an estimated $208 billion by 2035 through reducing and eliminating the disease. 7. Scientific innovations and new technologies will make preventing and treating malaria cheaper and more effective. Each year, bed nets become stronger and promise to last longer, next generation drugs stay ahead of resistance with several candidate drugs just on the horizon. 8. Elimination is already happening. The malaria map is shrinking. Four countries have recently been certified as malaria free and 26 of the remaining 104 malarial countries are now working to eliminate the disease entirely. 9. A committed community of advocates will not let us turn our backs. We have a moral obligation to finish the job we have started. A dedicated group of politicians, celebrities and parents will hold us to that promise. We have the leadership of the Confederation of African Football and star athletes, like Didier Drogba and Samuel Eto’o, whose United Against Malaria campaign will reach more than one billion people with malaria-related messages. We have El Hadj Diop in Thienaba, who created a grassroots movement around fighting malaria after his 12-year-old daughter died from the disease. Through the efforts of this one individual, there has not been a death from malaria in this region of Senegal over the past five years. From the Secretary-General of the UN to Bill Gates to 10-year-olds raising money from lemonade stands, our voices are growing in number and strength. 10. We need audacious goals. In the time it took you to read this post, a child died from an entirely preventable disease. If we continue to prioritize defeating malaria, it will happen. We have come too far to turn back. We have too much — too many lives — on the line. I look forward to the year, soon, when there is no need for a World Malaria Day.